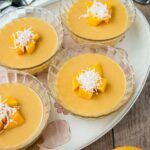 This mango pudding recipe is silky-smooth, creamy and bursting with fresh mango flavor! In a medium bowl, whisk together the gelatin and boiled hot water until no lumps remain. Whisk in the sugar and salt until dissolved. Stir in the coconut milk or cream, then mango puree until mixture is smooth. Pour into 4 ramekins or small bowls. Cover and chill for a minimum of 2 hours before serving. Homemade mango puree from fresh ripe mangoes is the best for this recipe because it gives the best flavor. Simply puree a heaping cup of fresh diced mangoes in a blender until smooth and measure out one cup for the recipe. If your mangoes are stringy, strain the puree through a sieve. However if fresh mangoes are not readily available where you are, you can use frozen or canned mango pulp. If using frozen mangoes, thaw and drain before pureeing in a blender. If using sweetened canned mango pulp, reduce the sugar by 1/4 cup. I like using canned coconut milk for this recipe. I find the tropical coconut flavor pairs really well with the mango. Also, the richness from the coconut milk gives the pudding the best creamy texture. If coconut is not your thing, you can use evaporated milk, half and half (10% M.F) or table cream (18% M.F). Mango pudding can be covered and stored in the fridge for up to 3-5 days.